I am impressed with V-Picks and their range of products. I feel confident that they have a pick for any type of player. People spend a lot of time and money on their guitar rigs, strings, cables, but guitar picks are usually something not many players pay attention to. Most guitarists, including myself, have usually tried a few selections from different manufacturers, a few different sizes and material types and have settled down. V-Picks Inc., a small family owned business, believes it is time for guitar players to try their brand of unique pick designs. They are convinced they have the right pick for all players and styles. The company shipped me a Fab Four package ($15 direct), consisting of 4 picks: a Small Pointed Guitar Pick, Medium Rounded Guitar and Mandolin Pick, Large Rounded Guitar and Mandolin Pick, Freakishly Large Rounded Guitar and Mandolin Pick. They also sent an Acoustic Package ($10 direct), which contains V-Pick Acoustic, V-Pick Large Lite Pointed, V-Pick Medium Lite Pointed. Vinnie was also nice to send one of their Night-Glow Medium Pointed guitar picks ($5 direct) which is the same as the see through picks but with some glow in the dark dye added to the process. All the picks in the review could be purchased separately. 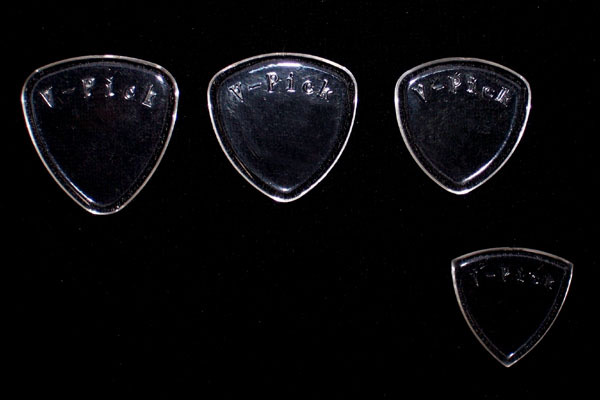 The thing that is common to all these picks is the fact that they are all made from a hard transparent acrylic material that sticks to the player's fingers. Most of these picks are also thicker than what I am used to. They're not cheap but as far as wear is concerned - it looks like they'd outlast more than a few dozen of the generic picks. The picks of clear material all have a tendency to get lost and at about $4 a pop that could be a problem. The 2.75 mm picks have a little indentation on one of the sides and I had to file them further as they were sometimes catching on strings while playing bass. Vinnie from V-Picks explained to me that all their molded picks have an indentation due to the manufacturing process and they do their best to buff it as much as possible but there could be some unevenness. Small pointed guitar pick - this pick is recommended by V-Picks as the replacement for small jazz picks. It is 2.75 mm thick so it was quite unusual that it felt natural in my hand. I was never a big fan of the traditional jazz picks as they seemed to get lost but this one is just big enough to do the job right. The thickness helped with sustain and the sharpened edges gave great note definition. If I was playing with jazz picks I'd instantly switch to these. Medium Rounded Guitar and Mandolin Pick - again at 2.75 mm thick, this pick felt very comfortable and gave great note definition. It felt a little slower and less aggressive than my usual 1mm picks for metal style playing, especially on rhythm guitar, so probably the Medium Pointed Guitar Pick would be more suitable for those styles as it has sharper edges. Freakishly Large Rounded Guitar and Mandolin Pick - at 3 mm, this pick felt too big for my taste on guitar, but players that like strong attack and the sound of a coin would enjoy this. As a matter of fact this is Carlos Santana's favorite pick, he likes them so much that he sell them via his website. I found this pick excellent for bass. Thanks to this one and the Large Rounded my bass sounds round and punchy without the overbearing pick clack of traditional bass picks. Acoustic - I didn't have any steel string acoustic to test it on. On nylon string guitar the heaviness of the pick added so much attack that it felt awkward. Again - probably down to personal preference, but I like to have a little give from the pick when playing acoustic, and I usually go for the 0.5 to 0.75 mm picks (V-Picks makes a 0.8 mm pick) and this one was 2.75 mm. On electric guitar this pick felt great but possibly a bit bulky for metal players. Again - another clear win for bassists. Large Lite Pointed - at 1.5 mm this pick is great for metal and rock rhythm guitar. Great note definition and the right size for fast picking hand work. Medium Lite Pointed - same as the Large Lite but smaller in size. Nightglow Medium Pointed - same as the Medium Pointed pick but glows in the dark. 2.75 mm thick and easy to find on a dark stage, with enough sharp edges for fast rhythm work as well as soloing. I am very impressed with V-Picks and their range of products. I feel confident that they have a pick for any type of player. At approximate price per pick at $4 it is understandable that some guitarists might decide to stay the course and get a dozen for that price, but they could be missing a truly personal experience by finding that special pick. I'd especially recommend V-Picks to bassists that are looking for a more natural tone, closer to finger-picked attack. The V-Picks are no brainer for blues and jazz as well - I had a really mean tone with lots of attack and sustain.